I’ve never really been a fan of history, as some of you will know from my earlier blog entry Horrible History: Hillforts and Hegemony, but it’s starting to grow on me. 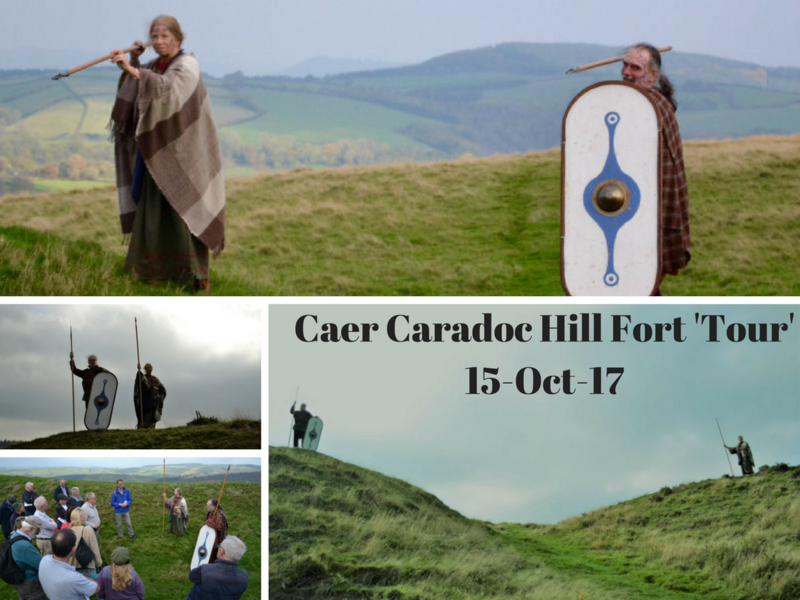 Last Saturday we went to a talk in our village hall, as part of the Chapel Lawn Woodland Fair, about the hill fort on the top of ‘our’ Caer Caradoc. The talk was given by Dr. Andy Wigley, who has the rather envious job title of Historic Environment Manager. Just over a week later we joined Andy and a few other Chapel Lawn folk on what could loosely be described as a ‘tour’ of the hill fort. The fort is a ‘scheduled monument’ which means that Historic England are keen to protect its heritage, and rightly so. As it turns out, we’re lucky to have such a well-preserved monument, due in part to the local landowner. Around the end of WWI, when the Forestry Commission were covering our land with hardy pine trees, they asked the landowner if they could plant some on Caer Caradoc. 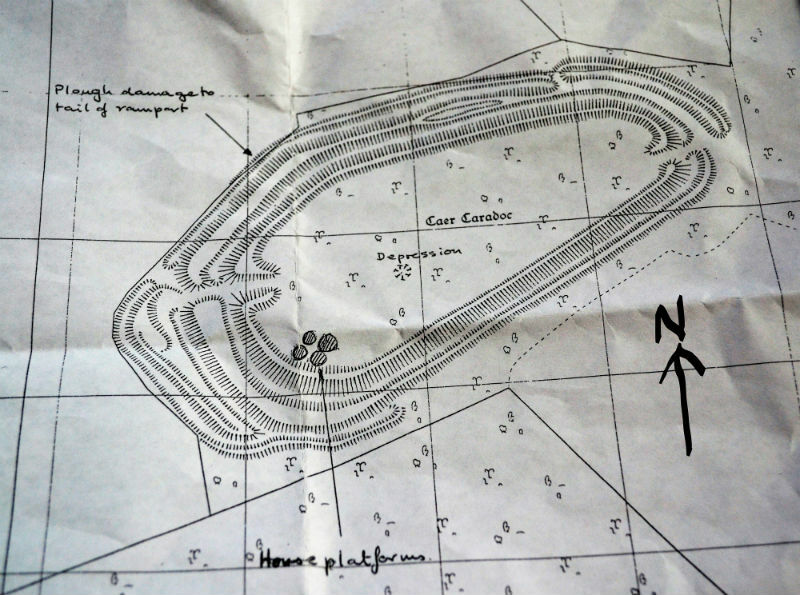 The response was an emphatic “No” and thankfully the hill fort has maintained many of its distinctive features, unlike other hill forts in the area which have been forested. There’s also an extensive gorse management programme, so Historic England provide financial incentives to local farmers to keep the site clear of invasive and architecturally- damaging gorse bushes. The fort is 375m long by 185m wide and runs west to east in line with the Redlake Valley, with a wide funnel-like entrance at the west end and a narrower entrance at the east end. The ditches and ramparts are well-defined, some as high as 7 metres, though Andy told us that they would’ve been even deeper when originally created. There are platforms and terraces on which huts would’ve been built, one of which (near the west entrance) could have served as some sort of ‘ticket office’ to check people coming in and going out. In the middle there’s also a deep narrow depression, which could have been a well. The diagram below gives you an idea of layout. As for who lived there, this is a matter of debate. When we listened to the talk in the village hall, the emphasis seemed to be on the fort being built to house agricultural workers during a period of enclosure. But when we were up there on Sunday you can’t help thinking it was entirely a defensive site. We were even treated to some ‘re-enactment’ on the tour, when a couple of local historians appeared wielding spears and chanting eerily. Either way, you had to earn the right to be there, bringing either food or skills in exchange for shelter. As you scour the landscape from the top of Caradoc, there are several other hill forts within view – Burrow Hill, the ‘other’ Caer Caradoc and Titterstone Clee to name a few. Shropshire has the densest concentration of hill forts of any county in England and it’s no coincidence that we’re right alongside the Welsh border. The University of Oxford Archaeology department has even created a hill fort atlas, so if you want to learn more then check it out: https://hillforts.arch.ox.ac.uk/. So when you visit us here at The School House B&B, we highly recommend a walk up Caradoc hill. If you take up the challenge, you’ll be treated to a piece of real history. And if, like me, you’re not much of a historian, it makes a cracking spot for a picnic. Here’s a taster with some drone footage that Dave took back in January.